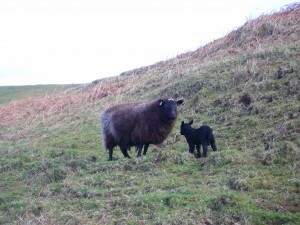 This is a blog written by Skye the sheep, a character from the Sheep called Skye series. She lives on the Isle of Skye with her family – Jacob, Jacuzzi, Owen and Ben – and they’ve just started up a recycling company. If you find this hard to believe, check out their stories here. Skye will be commenting on life from under the wool and would love to hear what view you have from your end of the field. If you would like to receive updates of Skye’s blog please click here. That is the question. Or is it? It’s like saying you have to choose between being clever or kind. Or asking someone if they would prefer to be good or beautiful. Come to think of it there’s always been a bit of a dispute between these two species and now it’s come to a head with the Chinese New Year. In the Bible I’m not sure if it was the sheep or the goats that offered food to the hungry and visited the prisoners. I would plump for the sheep because goats don’t have enough wool to keep someone else warm, but then I’m obviously a little biased. Not that I’ve anything against goats. They are a very intelligent race who are known to create lasting and loyal relationships with other creatures. In fact some of my best friends are goats. That’s why I think we should work together. Why not mix the wooliness of the sheep with the canniness of the goat? You organise the logistics of the food distribution and turn off those prison alarms and I’ll offer you my coat and go the extra mile with you. With your brains and my wool we’ll have a winning combination. Happy Easter! Happy New Year! Happy new life! One of my new year’s resolutions is to climb over the fence and discover what life is like in the next field or even the next country. That’s how I stumbled upon the Schaapskooi (sheep pen) in Blaricum in North Holland where every Sunday afternoon they hold an open house from 2-4pm. This great place is home to a special race of sheep called the Drenthe Heath which have thin gentle faces and long brown wool and are very beautiful. They are the oldest breed of sheep in Western Europe, going back to 4000 BC! Apparently they are very good at keeping the heather down and their wool is ideal for felt. There’s a famous designer called Claudy Jongstra who keeps her own flock of Drenthe Heath sheep and has even used their wool to make the Jedi costumes for Star Wars – imagine that! I’m sure my thick dirty coat won’t qualify for such stardom but still it made me feel quite excited to think of the dizzy heights to which we could all climb in 2015, if only we dare look beyond our own field. Happy New Year! Are you a sheep like Skye who doesn’t feel like a sheep? Or do you need to get away from the flock and discover new horizons, like Jacuzzi? Do you get taunted for being different and mixing with the wrong kind of creatures, like Ben? Or are you confused like Treasure and need someone to believe in you? Whatever kind of sheep you are, there’s a story out there just for you, waiting to warm you up. So why not treat yourself or your friends to a unique present this Christmas? Not available on Amazon! Special offer of £2 off every book from 1st December to 10th January. Hello there – I’ve heard it’s awkward for you humans when you come into a room and find someone wearing exactly the same clothes as you. This is something that we sheep have no problem with. I heard two walkers discussing this the other day and one said she wouldn’t make a big deal of it and would probably go straight up to the other person and congratulate her on her good taste. I noticed she was wearing a white woolly jumper so I decided to take her advice and do just that. But when she saw me heading towards her she took off as if I was a wolf in sheep’s clothing! Maybe she didn’t realize that her jersey had anything to do with me. Don’t worry, I wasn’t offended. I know that you humans are sometimes a little slow at making connections. We sheep have got used to the fact that what we own doesn’t belong to us anyway. I wonder when the rest of the world will discover that. 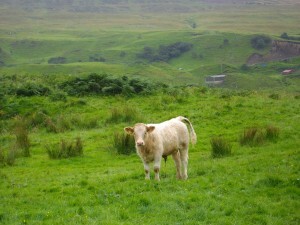 I asked my friend, Johnnie the calf, if he’d ever been on Facebook. He stared at me, puzzled. ‘I don’t think I’ve ever actually seen my face,’ he said. ‘Really?’ I couldn’t believe it. That beautiful soft, brown face with the velvet ears and the caramel eyes and the long, creamy eyelashes. The next day I took him down to the river so he could have a look at himself in his reflection. He stared and stared. When he’d finished I asked him how he felt about it. Johnnie shook his head, sadly. ‘Well, at least you know you exist now,’ I said to him. ‘I guess so,’ I said, feeling a little confused. ‘So does that mean I’m on Facebook now?’ asked Johnnie. ‘You certainly are,’ I said. I know I’ve been a bit quiet recently. You see I was waiting until I had something to say. And if I didn’t then I was just going to say nothing and wait. Wait until something came to me. And it did. It came to me one morning when I was having a break from munching grass and happened to see a heron flying slowly over the river. It lifted me up. I hope it lifts you up too. Mary Oliver’s beautiful poem. Everyone loves a lamb. You just have to watch them frolicking together in a field on their tiny legs with their tails swinging, as if they hadn’t a care in the world. Only to turn a few months later into a serious sheep with a heavy baggage of wool, intent on consuming as much grass as possible in the least possible time. What has happened? When did we lose that zest for life, that enthusiasm, that joie de vivre? Or, more to the point, how can we ever find it again? Well I’ve decided to leave my flock of sensible, steady, grazing companions and look at the world again through the eyes of a lamb. All those amazing blades of grass, those fragile fluttering butterflies, the bright blue coat of a beetle resting on a leaf. I want to recover my sense of wonder. Don’t forget you are never too old to feel young. So watch out for me when you go for that day in the country. In all those thousand shades of green you might just catch a glimpse of a merry black-faced sheep dancing among the buttercups in a field of gold! Does anyone out there know what a book crossing is? Well, it goes like this. Someone leaves a book in a public place with a label inside it, explaining that it’s travelling round the world looking for new friends. Someone else picks it up and takes it home with them. They can contact www.BookCrossing.com to find out where this book has been and let them know it’s now in safe hands. After a while that book gets left it in a different place for someone else to pick up and so it continues. I guess it’s a little like putting a message in a bottle or sending up a balloon with a label attached. Well, a few weeks ago that’s what happened to my story! My book was left in the comic museum in Angoulême in France. Maybe it’s still there having a good time with all the other comic characters. Or maybe it’s set off on an adventure all of its own. All I know is that it’s out there somewhere. And maybe one day I’ll get to hear news of it. That’s the beauty of book crossing. So keep a look out everyone – you might just come across a book today waiting for you to take it home and look after it for a while. If a book should come your way bring it home and let it stay. Treat it as you would your child, then send it out into the wild! Hope it’s not too late to wish you all a happy and woolly New Year! I’ll take my wool off to that. We sheep are known for our timid characters but let’s surprise everyone. 2014 is the year to be bold! Lots of people like telling you what’s good for you but I think you’ve got to trust your own instincts. For example we sheep, when we get ill, we know which sort of plants to look for to help us get better. Certain plants contain healing properties like tannins and saponins which kill internal parasites and protect us from disease. In Utah there’s a farmer doing research on this by using his fields as a natural pharmacy. 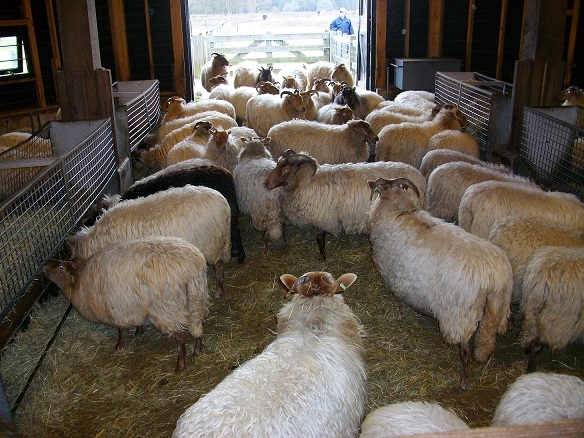 He has even penned off part of his farm as a self-service cafeteria where sheep are encouraged to associate bitter tasting medicinal plants with feeling better. And it seems we may be able to help you humans too. After years of using chemicals in the battle to get rid of giant hogweed, that huge umbrella-like plant that can burn your skin, a farmer in Aberdeen has bought 20 sheep instead. Sheep chew at the plant in its early stages when its just coming into leaf, thereby reducing its spread. So I’m putting in a little word in praise of plants. It takes all sorts to make a world and it’s no different in the plant kingdom. Some are graceful and golden like the wild iris and others are cheerful and cheeky like buttercups and daisies. Some are delicate like cow parsley or smell delicious like water mint. Some can be poisonous and prickly but others are life-giving and healing. And a nibble a day of the right sort of plant could even keep the doctor away!